We now have a finance option. At Crum Funeral Home, we are dedicated to providing our families with the opportunities needed to heal after the loss of a loved one. So whether you choose a unique, very personalized funeral service or a traditional funeral service, we are here to assist you in fulfilling whatever needs you may have. A common concern families often have is the cost of the funeral. Although we do offer pre-paid plans, that is not always in place when funeral arrangements need to be made making it even more stressful when it’s time to consider cost. 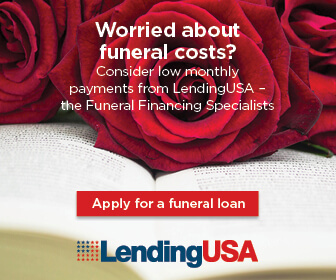 To better serve our families in these stressful and difficult times, we have began working with LendingUSA, who can provide affordable funeral loans with a simple application.